Power of Music through music therapy, singing and sharing music deliver planned sessions that incorporate peer support and social interaction. Our music sessions are designed to help people and their families living with a long term condition such as dementia. Meeting people and sharing music on a regular basis encourages peer support creating important networking where people come together to share their experiences. The Power of Music CIC already has two Community Choirs called the “Songbirds” in West Lancashire. The project is to develop “Singing For Health” sessions delivered by some of our choir members and our choir facilitator within residential and day care settings for people living with a long term health condition such as dementia, COPD, stroke and mental health. The Power of Music has already worked with the British Lung Foundation, Stroke Association and the Alzheimer’s society. Our aim is to help and support people who can be isolated and dis-empowered as a result of the advanced stage of their dementia or other long term health conditions. These musical and personal interactions identify and build upon areas still intact in a person suffering the losses associated with the later stages of Alzheimer’s or, other forms of dementia or stroke such as memory, physical capacities, personality changes and accompanying loss of identity. 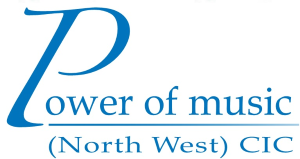 Power of Music can deliver a “Singing for Health” programme designed to support care staff to develop their understanding of how music can benefit and support the emotional needs of people with dementia in the context of a person-centred approach to dementia care.